This is an awesome idea. When someone pulls the fire alarm, we’re going to handcuff them to that very spot. If they were stupid enough to pull a fire alarm some place close to, you know, a fire, well that’s their own fault. THE sending of false fire alarms by mischievous persons may be eliminated through use of a newly developed call box. To use the device, the sender of an alarm must pass a hand through a special compartment to reach the signal dial. Once the dial has been turned, the sender’s hand is locked in the compartment until released by a fireman or policeman with a key. I’ve actualyl seen an old documentary video of this alarm system at work. 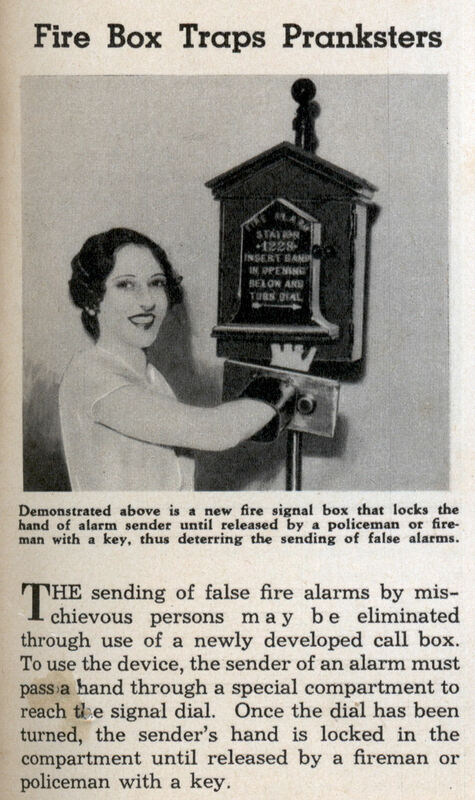 It was developed because of too many false alarms going off. Particularly children used to play around with there “fire boxes” and caused a great deal of alarms which called for an immediate development of an system which would help identify the person who originally triggered the alarm. The hand must be vertically inserted throught the bottom of the housing to get to the actual trigger. When the trigger is pulled the alarm goes off and the bottoms plate part clamps onto the users wrist. I’m not sure about the actualy mechanics involved, but it would work even with non-adults (the clamp adjusted to the correct wrist size). Note that the bottom plate comes off completely and isn’t attached by cable or chain as mentioned at digg.com. The bottom plate was made of heavy duty steel and was designed to be so big that it was hard to conceal under clothing. 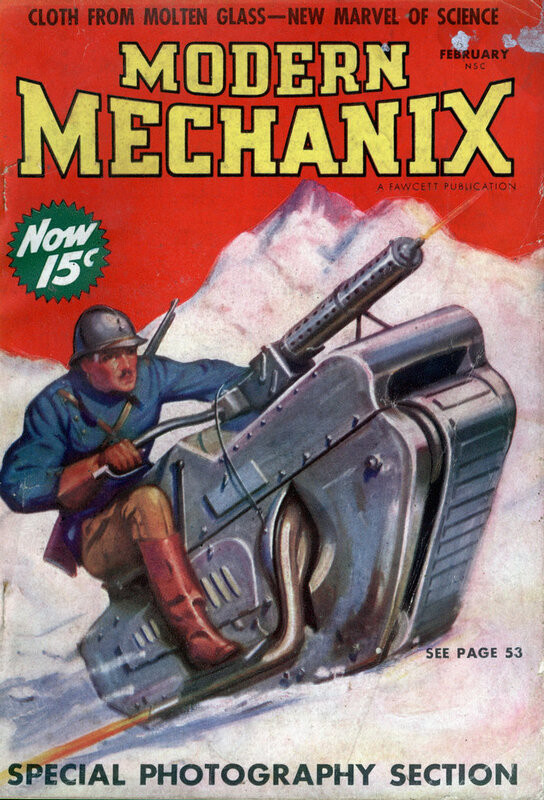 I consider this to be quite an interesting invention which did it’s job well, but it wasn’t very widely spread due to the fact that it was more costly to make and people didn’t like the idea that they had to put their hand deep into the box and then have the thing clamp of their wrist. This gadget might be a useful determent behind the cover-flap of a car’s gas compartment, to deter siphoning. Ah, it was likely just a chop reporting job. It’s just an iron hand-cuff that “marks” the wrist with a physical object, which the cops then remove later, and little kids have a lot of explaining to do to Mom and Dad about why they are hiding their arm for half a day after the fire alarm went off. Now the moral question is: do you get our your grinder and save your kid from being given a criminal record, or do you narc on your own son to “teach him a lesson.” Besides, how stupid could a kid be to not IMMEDIATELY figure out how to use a coat hanger to pull the lever instead of sticking his hand through a suspiciously dangerous looking clamping device? I mean that even defeats modern (permanent red skin dye spraying) alarms. Or just ket Mikey to do it; he’ll do anything! This is a pretty good idea. I remember in high school we would have at least 4 false fire alarms a month. This doesn’t trap whoever pulled it to once spot, it just attaches a heavy metal wristband on them so they can be identified. This should be implemented in schools today. ok, you will not die, attached to a wall, and burned alive. the bracelet device attaches to your arm, then you walk out of the building with everyone else. Aparato diseñado para evitar que alguien pulse la alarma de incendios sin haberse producido incendio alguno. El dispositivo evita que se pueda pulsar la alarma anonimamente…. Yeah, everyone would have to die in that building before I would give up my life to save them. Meanwhile the prankster goes around pulling the pull stations with a coat hanger. No one has figured to just use a coat hanger ?